They were style with substance, swing with swagger and a non-stop party that everyone wanted access to. Now audiences can experience this critically acclaimed, hugely entertaining theatrical production which includes exciting new arrangements of the classic songs everyone knows and loves. 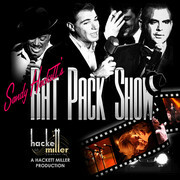 In addition, audiences will hear original, never before heard songs written by the late, legendary songwriter, Ron Miller (For Once In My Life), and recorded voiceovers made exclusively for this show by Sandy Hackett’s father, the late, legendary comedian, Buddy Hackett.